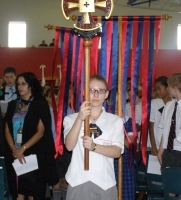 Canterbury College is an independent day school afﬁliated with the Anglican Diocese of Brisbane. Canterbury College is a community of like-minded people who share a dream of having all students achieve their potential in an inspiring learning environment. Not only do students of Canterbury College enjoy a wonderful environment of expansive playing ﬁelds and exciting architecture, they are also a community committed to Anglican Christian values, the pursuit of intellectual endeavour, the development of creative ideas and the acceptance of differences and diversity. The school is committed to developing conﬁdent young people with high self-esteem and self-discipline. Canterbury students receive a well-rounded education, both within and outside the classroom to assist in the development of their spiritual, social, cultural and academic life-long learning. The College atmosphere is founded upon good relationships among staff, students and parents, as well as the wider community. The College ethos is based on mutual respect, support and cooperation. The rich and diverse academic program is supported by a full curriculum of activities, camps and excursions. Technology is integrated in all year levels, providing students with access to shared sets of laptop and desktop computers as part of their day-to-day learning. The College offers a rich curriculum, with opportunities for all students to pursue their dreams through ﬂexible pathways to university, further education or employment. Why choose Canterbury College for your child's future education? Canterbury students receive a well-rounded education, both within and outside the classroom to assist in the development of their spiritual, social, cultural and academic life-long learning. The College atmosphere is founded upon good relationships among staff, students and parents, as well as the wider community. The College ethos is based on mutual respect, support and co-operation. The rich and diverse academic program is supported by a full curriculum of activities, camps and excursions. Technology is integrated in all year levels, providing students with access to shared sets of laptop and desktop computers as part of their day-to-day learning. From an academic perspective, the Year 12 cohort performed outstandingly with over 79% of the OP eligible students receiving an OP between 1 and 15. This result places Canterbury College above the State average. The Senior Education and Training Plan (SET Plan) process during Year 10 and formal conversations with specialist staff in Years 11-12, parental involvement and support are all vital in this consultative process when determining courses of study for Years 11 and 12. Some Senior students also study subjects from university courses for one or more semesters through the College’s association with Grifﬁth University, Queensland University of Technology, the University of Southern Queensland and University of Queensland. University Subjects could include: Commerce, Education, Engineering, Information Technology, Law and Legal Process, Mathematics, Nursing, Performing Arts, and Psychology. Students who successfully pass such subjects receive credit in subsequent university studies and can gain preferential entry to the related course after completing Year 12. The schools facilities are continually expanding and improving to reflect the professional and progressive nature of education at the College. Pathways include a rigorous traditional academic program as well as Vocational Education and Training programs or a combination of both. Senior students may also complete school-based apprenticeships and traineeships. Canterbury students gain experiences and skills inside and outside the classroom, through camps, retreats, conferences, workshops and other on-campus activities and excursions that are either academically-focused or part of our rich pastoral care program. Senior School students undertake School-based Apprenticeships, Traineeships, complete Certiﬁcate and Diploma courses and work placements as well as work experience. School-based Traineeships and Apprenticeships allow students to work for an employer and train towards a recognised qualiﬁcation, while completing high school. Several students who successfully complete their traineeships and have used them as a benchmark to gain a Tertiary Rank, to continue onto the next level or to secure full-time employment. 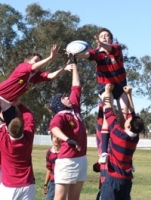 Canterbury College provides year-round opportunities for Middle and Senior School students of all skill levels and interests to participate in a range of sports. Through the Senior Sport (TAS) program students can participate in inter-school competitions and represent the College in both The Associated Schools (TAS) sporting competition, which currently includes nine schools from across the wider Brisbane area, as well as other competitions.